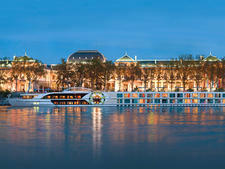 Tauck River Cruising's ms Joy is the fourth of the line's newer class of ships -- the line eradicated class names after embarking on a massive refurb effort in 2017 -- and a sister to Inspiration, Savor and Grace. 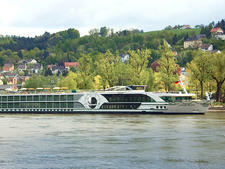 It launched in 2016 and sails the Danube River. 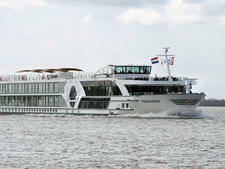 The vessel is 443 feet and accommodates 130 passengers: ships of the same size operated by other lines carry up to 190 passengers. You'll find four Tauck employees onboard: the Cruise Director and three tour directors; the rest of the crew is from a company called Scylla. We sailed on the ship at the height of the summer vacation, when it is sold as a Tauck Bridges product, and caters exclusively for young families. Outside of this time, expect a typical demographic of boomer age couples (68+). The ship is beautifully designed, with an impressive glass and marble reception area, brass fittings and sumptuously upholstered chairs and sofas. Cabins are a good size, but in order to achieve that, they have sacrificed balconies (there are "French" balconies, which are basically sliding-glass doors). 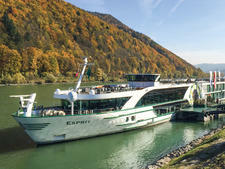 If you have been on a modern riverboat, you will know the basic layout: one main dining room at the front and a large lounge above; a small dining room/cafe (In this case, "Arthur's," named after the grandson of the founder) at the back where food is served all day; and cabins in between. There is also a tiny gym, spa and salon. The top deck is given over to seats and loungers, and features a small putting green and a hot tub. 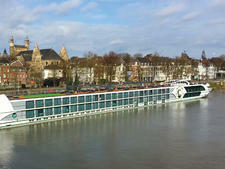 Tauck is an upmarket operator and these tours don't come cheap, but life onboard reflects that. The cabins are very comfortable, and the food is superb (albeit rather meager portion-wise). In addition, everything is included -- from the Wi-Fi to the tours, the food, the wine, the entertainment -- both on and off the ship. You are well looked after, and the Tauck team is a very thoughtful bunch, often anticipating needs, especially those of the kids. 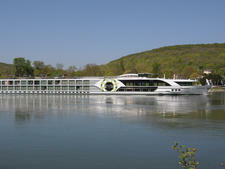 A Tauck Bridges river cruise is an excellent way to see central Europe -- in comfort and style. 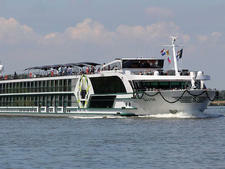 And during the rest of the year, Joy serves its regular passengers with typical Tauck service and responsiveness. You won't want for a thing. Tauck attracts affluent passengers who are well-acquainted with group travel; many have been on one or more of the company's land tours. Passenger ages range from 60 to 75, with the average being about 70; there's a smattering of people in their 50s as well as those who are older, but this is not the norm. Most of the passengers are American, although you'll also find people from other English-speaking countries such as the U.K. and Australia. 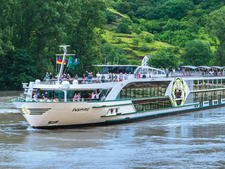 During summer vacation sailings when the ship is dedicated to Tauck Bridges, expect exclusively families with kids of eight years old and above. There are many families traveling with grandparents, too. Almost all hail from the U.S. and Canada, with a tiny smattering of Brits. Casual throughout the day. People do throw on a jacket and a nice dress in the evening, but there are no "formal" nights on Bridges cruises. It's worthwhile packing a good selection of hiking and biking clothes, as well as hats and raincoats; even in mid-summer it can rain. All shore excursions, airport transfers, all gratuities and unlimited complimentary beverages on the ship -- including regional wine, beer, premium spirits, specialty coffee, water and soft drinks -- are included in the fare. The only things you pay for are gifts, laundry or a spa or hair treatment. The onboard currency is the U.S. dollar. Tipping is neither expected nor required.